Office Safety Basics - The purpose of this program to provide you with the general overview of the safety hazards present in the office and outline steps that you can take to minimize risk. 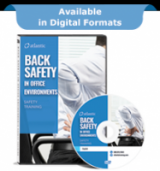 Atlantic's training products on "Back Safety in Office Environments" discuss situations that can lead to back injuries and what employees can do to avoid them... both at work and at home. This program will cover the things your employees can do to keep their backs healthy. This program covers ergonomics in the office environment and how to avoid the fatigue, strain and stress that can result from the poor office setup. Our knees are important to many of the moves you make each day. And there’s a lot that can be done to avoid a knee injury. This program will cover the things your employees can do to keep their knees healthy. This course discusses MSD prevention techniques in office environments, examples of awkward postures and positions, proper lifting technique, workstation setup, work habits, and stretches. This course discusses MSD prevention techniques in industrial environments, including engineering and administrative controls as well as motion-based, physical, environmental, and psychological risk factors associated with MSDs. This five part series covers sitting, standing, stretching, ergonomics and lifting. Using a unique “talk show” format, each segment focuses on the individual topic so employees are able to give the topic their full attention. This program discusses posture and how it impacts the proper use of mobile office equipment, the special challenges it presents and the importance of positioning and moving our bodies as we work. This video will help to teach your team the basic concepts, knowledge, and skills necessary to perform an ergonomic task analysis in a manufacturing setting. This program guides your office/ergonomic team step-by-step through identifying and analyzing the stress-causing conditions and bad habits that lead to discomfort and injuries. Classroom and field sessions teach participants how to make effective ergonomic improvements. This program contains two modules designed to provide your employees with an understanding of the importance of ergonomic awareness and how to implement an effective ergonomic plan in your company. Discuss prevention techniques in an office environment to avoid musculoskeletal disorders. Elements of Back for the Health Care Industry, educates employees on how to properly care for their backs and prevent injuries in a health care setting. This program covers proper techniques for patient movements and transfers. Also included is information on the use of transfer tools to make jobs easier and safer. Carpal tunnel syndrome is caused by consistently compressing a nerve that travels through a fibrous tunnel in the wrist to the hand (hence, carpal tunnel) and one good way to get it appears to be typing and mousing around with your wrists at an angle for long periods of time. While CTDs or Cumulative Trauma Disorders are a medical disorder and treated as such, ergonomics, the fit between people and their tools and workplaces, represents an important ingredient in treatment and prevention. The bottom line is that ergonomic approaches to CTDs can be viewed simply as good management. Documented evidence supports claims that ergonomic solutions are clearly cost effective because of increased productivity and work output. Cumulative trauma disorders are the fastest growing category of occupational injuries in the United States. This program will help you identify ergonomic hazards in your work area and focuses on the prevention of the most common injuries you will face as a healthcare worker. This video training program will discuss on musculoskeletal disorders, carpal tunnel syndrome, material handling and much more. Office And Computer Ergonomics - In this short training program, we're going to discuss only one part of a good safety program. It's called ergonomics. Ergonomics is nothing new, but there have been a number of improvements and advancements in the study of ergonomics in recent years. This program will help you control your safety at work much better. This course addresses one of the most prevalent and costly safety and health problems in the modern workplace and provides useful information for putting a program into place. . Whether your staff is moving patients, test tubes, laundry or food, they need to protect their backs from undue stress. All healthcare workers have a high risk of developing musculoskeletal disorders or back injuries. Stopping Ergonomic Injuries program discusses types of injuries, engineering controls, and personal protective equipment relating to ergonomics. Everyone has seen or heard about ergonomics. Most of us have an understanding about ergonomics and what it means, but we don't always incorporate this knowledge into practice on the job. Safety Orientation In Office Environments - Office safety is perhaps more important than safety in a manufacturing environment. The most important part of office safety is thinking safety on the job in an office environment. Injury statistics show that 85 to 98% of all accidents/injuries result from unsafe acts of employees. You can deliver professional, high-impact employee safety training presentations in PowerPoint--even if you've never worked in PowerPoint. 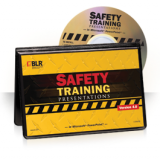 This fully equipped program gives you everything you need to train on 25 safety topics. In this short training program, we're going to discuss only one part of a good Safety program. It's called Ergonomics. Ergonomics is nothing new, but there have been a number of improvements and advancements in the study of ergonomics recently. Ergonomics And The Industrial Environment - This course outlines the approach most commonly recommended for identifying and correcting ergonomic problems. It provides basic information that will be useful for employers, workers and others in designing effective programs to prevent Work-Related Musculoskeletal Disorders (WMSDs) in an industrial environment. This program was designed to cover some of the different issues surrounding ergonomics as it applies to the Video Display Terminal or VDT. Like any tool or workstation, if you do not use the computer correctly, you can cause damage to your body including eyestrain, carpal tunnel syndrome, and stiff neck and back. In this short training program, we're going to discuss only one part of a good Safety program. It's called Ergonomics. Ergonomics is nothing new, but there have been a number of improvements and advancements in the study of ergonomics recently. Let's take a look at this important topic because everyone needs to know the hazards associated with ergonomics. Back injuries and other musculoskeletal disorders are rampant in the healthcare industry. According to the Bureau of Labor Statistics, nurses' aides, health aides, radiology technologists and therapists, as well as licensed practical nurses and registered nurses, make up six of the top 10 professionals at the greatest risk for back injury. Using common sense, simple exercises, proper lifting procedures and having an understanding of back stress can help you teach employees to take care of their backs. All employees have the responsibility to work and act in a safe manner. The company provides safety programs and employees help to make them successful. This program provides basic guidelines for safety in a recycling facility.